With my birthday right on the third day of the month, I got many wonderful books, without having to spend a single penny on them. And they just kept coming. Until today - and now there are seven. A huge thanks to all the generous gift-givers! 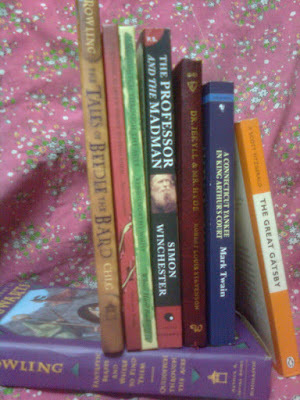 Now I own seven books that I am desperate to read. I will have to wait till October to finally get to read all od them, though, considering that I'm supposed to study for my exams as we speak (not that we are speaking right now; but I'd rather write it and explain this than not write it at all.) These are seven of the most awesome gifts I have received in my nineteen years of existence. One might say I am exaggerating the awesomeness. In which case, I would suggest one to look carefully at the photograph. Yes, that's right; it says The Tales of Beedle the Bard. Followed by the red and green books, that are Fantastic Beasts and Where to Find Them and Quidditch Through the Ages. Which would mean I am actually understating the awesomeness, for I fear I might start acting like one of those crazy, squeaky fan-girls if I don't. Enjoying J. K. Rowling all over again; now that's something I'm definitely looking forward to. October is surely going to be a hell of a month! Tales of Beedle the Bard? I feel jealous!! btw a late Happy birthday!